Portrait of Giuliano de' Medici, after Raphael. Giuliano di Lorenzo de' Medici KG (12 March 1479 – 17 March 1516) was an Italian nobleman, the third son of Lorenzo the Magnificent. Born in Florence, his brothers were Piero and Giovanni de' Medici. His older brother Piero was briefly the ruler of Florence after Lorenzo's death, until the republican faction drove out the Medici in 1494. Giuliano moved therefore to Venice. 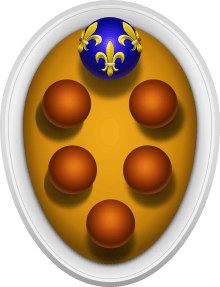 The Medici family was restored to power after the Holy League drove the French forces that had supported the Florentine republicans from Italy. This effort was headed by Spain. 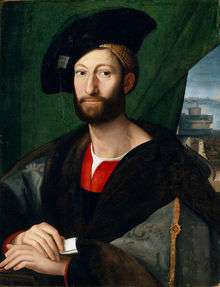 Giuliano reigned at Florence from 1512 to 1516. He married Filiberta (1498–1524), daughter of Philip II, Duke of Savoy, on 22 February 1515, at the court of France, thanks to the intercession of his brother Giovanni, now Pope as Leo X, in the same year Francis I of France (Filiberta's nephew) invested him with the title of Duke of Nemours (which had recently reverted once again to the French crown) on the occasion. 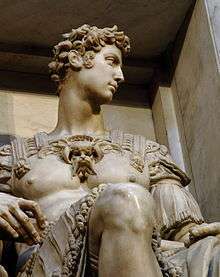 The French were also apparently grooming him for the throne of Naples (in which the French maintained a historical interest), when Giuliano died prematurely. He was succeeded in Florence by his nephew Lorenzo. Giuliano left a single illegitimate son, Ippolito de' Medici, who became a cardinal. Giuliano's tomb in the Medici Chapel in the Church of San Lorenzo, Florence, is ornamented with the Night and Day of Michelangelo, along with a statue of Giuliano by Michelangelo. Due to the identical common name (Giuliano de' Medici) which he shares with his uncle, whose tomb is also in the Medici Chapel, his tomb is often mistaken for that of his uncle.